in classic tori fashion, she pointed to her noggin, which meant it was going to be fun listening to her dictate it to me. “okay, wait just a second.” i grabbed a notepad and pen from the kitchen desk, right where they’ve always been for the past nearly 20 years, and prepared myself to take note. 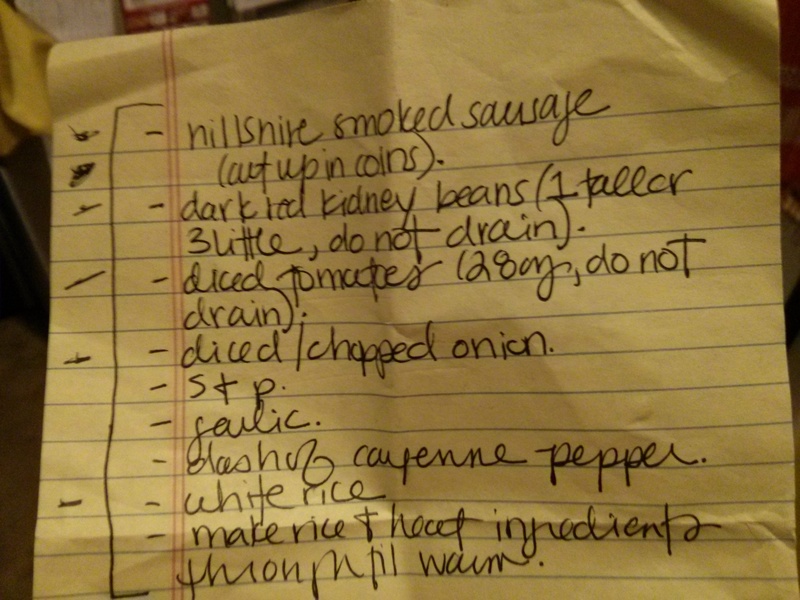 i present, here, tori’s secret red beans and rice recipe in all its glory! the measurements and preparation here made enough to feed clark and i nearly all week. his portions tend to be a bit larger than mine, but regardless, you’ll have plenty to share, or not; it’s up to you! cook up some rice according to the package directions, as much as you think you need. i found that about 8 cups of cooked rice was the right ratio for the final product. 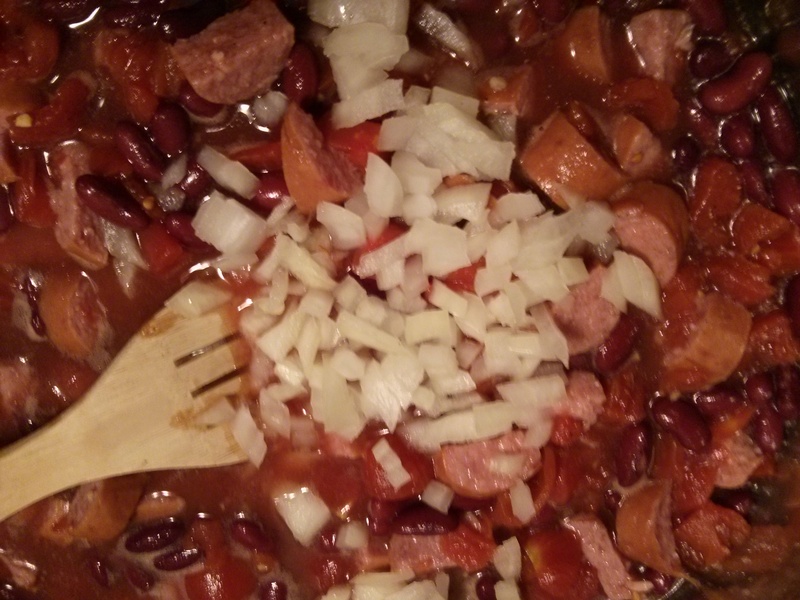 get out a big ‘ole pot and first dump in the kidney beans and tomatoes. put the heat on medium/medium-high, depending on how quickly you need it warmed. 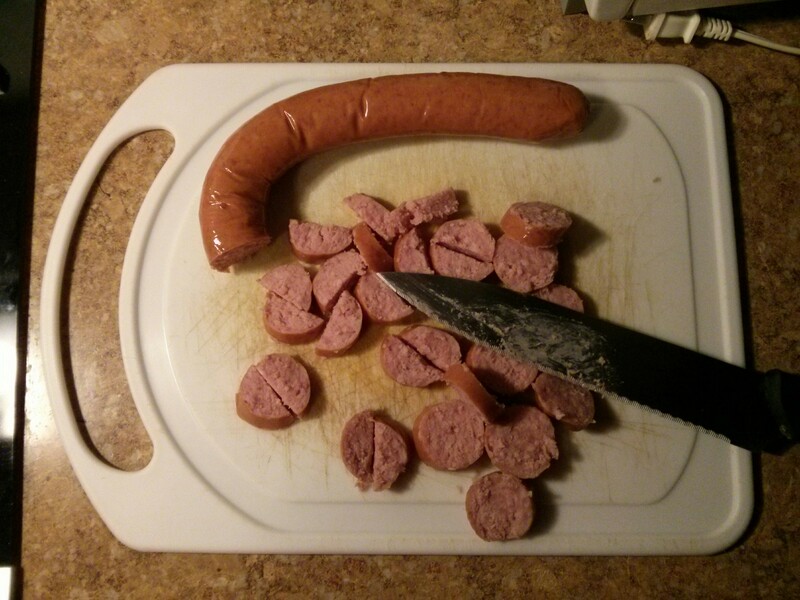 slice the sausage into coins and then halve the coins so that you have quarters. coins? quarters? ha, weak money humor. 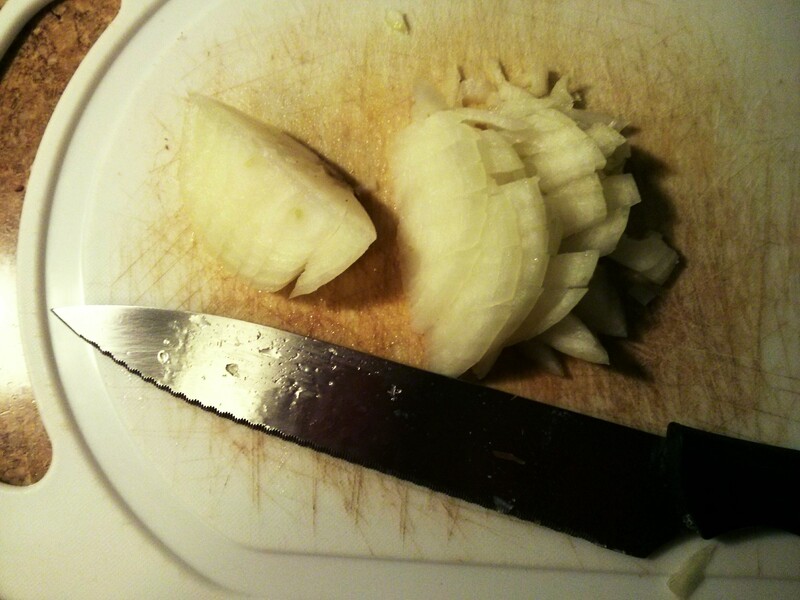 dice up that onion and then pat yourself on the back, because you’ve gotten better at dicing onions, as opposed to when you first started being an adult and half the onion went to waste because you didn’t know what to do with it. add everything to the mix and let it get nice and hot, and then! almost drop your phone right in the pot because Lord knows you’re made of money and can afford a new phone at the drop of a hat, right? heh, that’s quite a sense of humor you have, my dear! as you heat it up, add in salt, pepper, minced garlic, and cayenne pepper. 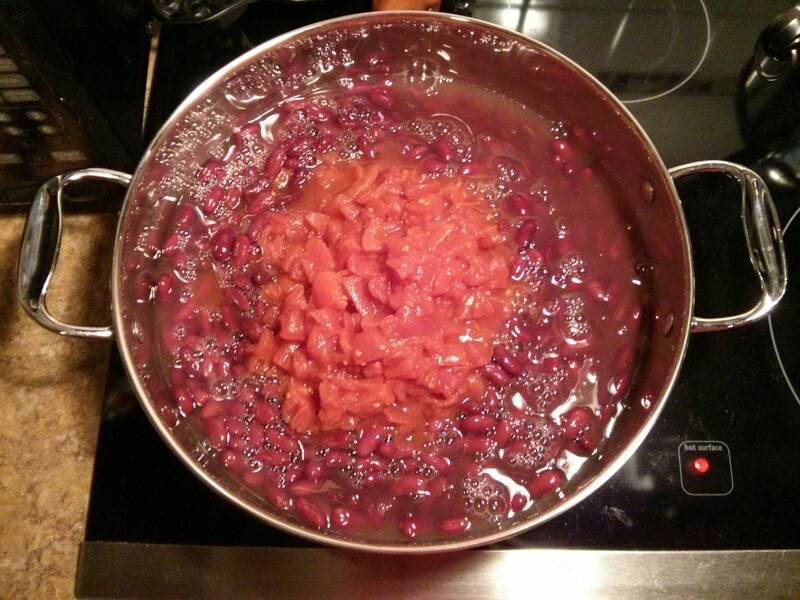 let the flavors simmer and meld, give it a taste, and then decide if it needs more. i bet some tobasco sauce would be a pretty good choice, too. 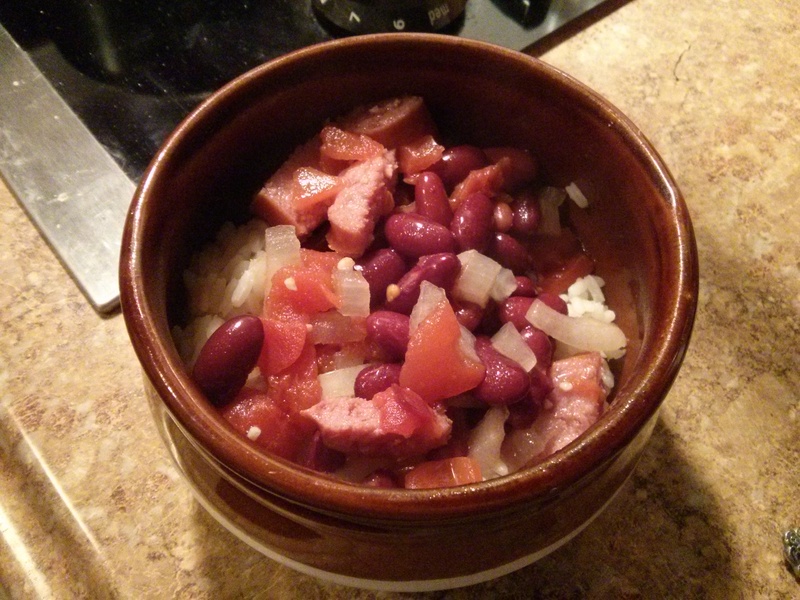 scoop that rice into a bowl and plop a bunch of the red beans and sausage on top. finally, take it into to the office and show off to your coworkers. they’ll be jealous because this homemade meal took you all of about 20 minutes and i’ll be damned if it doesn’t look amazing!